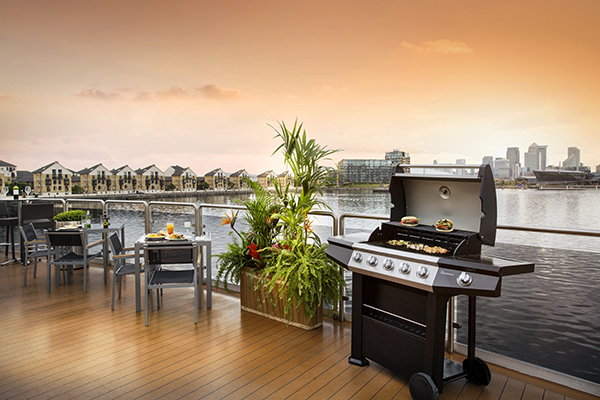 The Sunborn London superyacht hotel in the Royal Victoria Dock will host a new series of BBQ Thursdays throughout summer 2018, taking place each Thursday until the 31st August. This casual dining experience is hosted in the Sundown Bar and Terrace on Sunborn’s 3rd deck, with panoramic views over the East London skyline. From 5pm-9pm every Thursday, Sunborn serves a special BBQ menu – choose from burgers and steaks to grilled sea bass and vegetable skewers with a selection of sides – accompanied by live entertainment and expertly mixed cocktails in the newly-refurbished lounge. Guests can enjoy the beautiful sunset over the Thames, sipping on Sunborn’s ‘cocktail of the week’, while their speciality grills are created in front of their eyes.